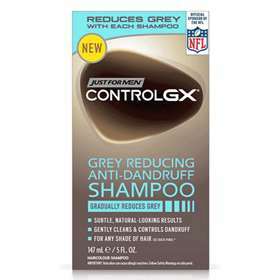 Just for Men Control GX Grey Reducing Anti-Dandruff Shampoo 147ml reduces grey a little bit with each shampoo for subtle, gradual results. Use daily until you like what you see, then regularly to maintain the look you like. Just for Men Control GX is a shampoo that gently and thoroughly cleans hair. Relieves scalp ith, dryness, irritation and helps prevent flakes, while it cleans. Increases volume for a thicker, fuller look. For any shade of hair. Hair Colourants can cause severe allergic reactions. Before using this product. You must perform a preliminary 48-hour skin allergy test according to accompanying directions. This product is not intended for use on persons under the age of 16. Temporary "Black Henna" tattoos may increase your risk of allergy. You have already experienced any reaction to this or any other hair colour product. You have a rash on your face, an irritated, sensitive or damaged scalp. You have experienced a reaction to a temporary "black henna" tattoo. Aqua, Disodium Lauryl Sulfosuccinate, Decyl Glucoside, Cetearyl Alcohol, Glycol Stearate, Ethanolamine, Zinc Pyrithione, Cocamidopropyl Hydroxysultaine, Guar Hydroxypropyltrimonium Chloride, Sodium Cocyl Isethionate, N, N-Bis (2-Hydroxyethyl)-P-Phenylenediamine Sulfate, Acetic Acid, Aloe Barbadensis Leaf Juice, Chamomilla Recutita (Matricaria) Flower Extract, 1, 2, 4-Trihydroxybenzene, Cetearyl Glucoside, Erythorbic Acid, Sodium Sulfite, Phenoxyethanol, Caprylyl Glycol, Stearamide Amp, P-Aminophenol, Panthenol, Sorbic Acid, Parfum, Limonene, Linalool.